Revising the UNIGIS Masters in GIS curriculum to integrate modern developments in cartography, and to polish existing coverage of mapping traditions. Cartography is one of the oldest and richest design traditions. Centuries-old theories of geographic visualization are routinely drawn on by modern experts in map production. At the same time, the modern discipline of cartography is experiencing a renaissance of theory, methods and technologies, instigated by the challenges of highly dynamic and massively data-driven geographic publishing platforms. I worked with Dr. Charles Burnett of Geomemes Research to update the cartography curriculum of the Masters degree in GIS offered by [email protected] We developed presentations, resources and exercises drawing on the best ideas in modern geographic visualization, as well as polishing existing coverage of classic cartographic method. 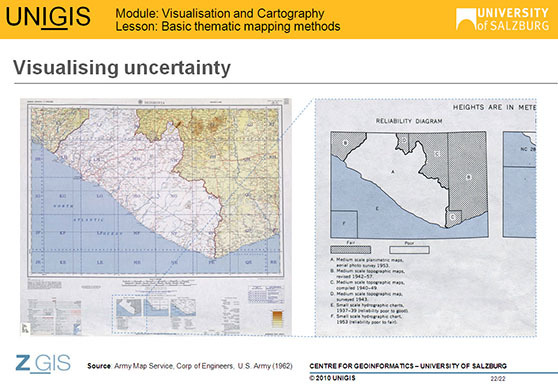 UNIGIS is a is a leading distance-education graduate program in GIS. The UNIGIS program has been active since 1992, and enrolls over 600 students each year. The University of Salzburg is a member of the UNIGIS Association’s world-wide consortium of universities, offering a Masters in GIS in english and german.